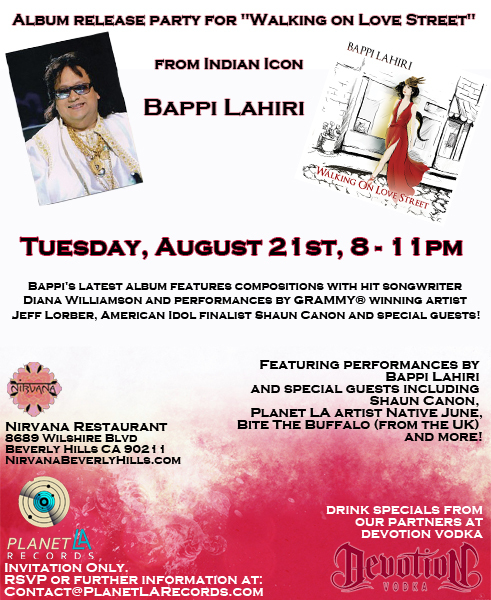 Tuesday, August 21, 2012 from 8-11pm at Nirvana Restaurant & Lounge, 8689 Wilshire Blvd, Beverly Hills, CA 90211. Featuring performances by Bappi Lahiri, with special guests Shaun Canon, Native June, Bite The Buffalo and more! Drink specials from Devotion Vodka. Full menu available.